I've been a lucky lucky blogger this last week or so with all manner of books from all manner of people arriving in the post and I've been diligent over my thank you letters too. I'm not sure publishers really appreciate their inboxes cluttered up with "thank you so much for the..." type messages when all they've done is kindly sent me a proof copy but it's an ancient inbuilt habit so I can only apologise. Sometimes a book arrives, you open it right out of the package, make a start and just carry on. It's hollering and blowing a hooley outside, you're warm and snug in bed, someone's delivered a nice cup of tea with the post and there seems no point in shifting. A book for older children set in the 1600's amidst witch hunts, hangings and sailing off to the New World with the pilgrims, this is the diary of young Mary as she fights to survive in the climate of fear and suspicion that faces her when she arrives in Salem.There's some quilting too which fits well around ideas of fragmented extracts from Mary's diary piecing together into a whole. 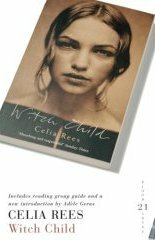 I was transfixed by Witch Child and just sat (reclined) until I'd finished it.There's a sequel, Sorceress, which I shall be onto in a flash and much more of Celia Rees to come. The book reminded me of two things,not only Alias Grace by Margaret Atwood, an entirely different book but another that uses patchwork as a foundation for its structure, but also Form 5C's triumph at the Nonsuch Girl's School drama festival 1970. We had some hugely talented and serious actors in our class (not me, I always ended up laughing so was dispatched to the costume department and a sewing machine) and we entered the festival with Act 3 of The Crucible by Arthur Miller. I'm shivering now at the mere thought of the girl who played Abigail, meek, quiet and unassuming until you put her on a stage.The moment she let rip with that scream was never to be forgotten, made it all so easy for the others to follow and we just about had a real life hysteria moment of our very own going on.It all went on a bit longer than it should have done. Well it brought the house down at the end and I think the judges were so relieved that Abigail & Co had all eventually managed to stop screaming the Drama Cup was ours.